Search Engine Optimization and Search Engine Marketing work together to give companies a competitive edge in their marketplace. When people enter search terms into a search engine, they see results pages that display websites that match the search terms based on relevance, quality, and other metrics. Search engine users also see paid results that resemble organic results but appear either at the top or bottom of the results pages. Companies that want to get more attention from search engine users pay to have those ads conspicuously placed to get more traffic to their website. As a practice, SEO uses tactics such as keyword relevance, meta information, and content quality to rank high in search engine results. Many people begin their search for products and services they need by visiting Google, Bing, and other search engines. When those people enter a query, the search engine displays pages that contain results based on relevance, quality, and other metrics. Web sites that appear near the top of the Search Engine Results Pages (SERPS) get the most attention from users. In fact, sites appearing near the bottom of the first page and on subsequent pages draw microscopic amounts of attention and generate only small amounts of traffic to destination websites. SEO helps businesses to improve their position in SERPS, with the expectation that their increased visibility will result in more traffic to their site. The increased traffic volume will presumably lead to increased sales. 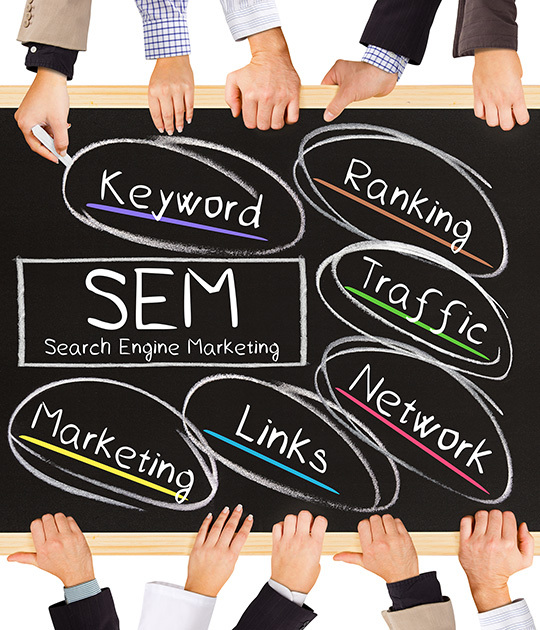 SEM expands upon the concepts of SEO by adding paid listings and advertising to attract more attention and draw more traffic to the marketer’s website. Paid positioning helps firms jump to the top of the SERPS, gaining attention from search engine users, resulting in traffic to their website. Companies pay every time someone clicks on their paid link or advertisement. SEO tactics require a disciplined approach to content creation over a prolonged period. Factors that affect the success of SEO includes the number of inbound links to a site, keywords integrated within online content and metadata, visitor engagement rates and content quality. Search engines such as Google frequently update the algorithms that generate search results, making SEO an ongoing and dynamic process. Many businesses do not have the knowledge, skills, and experience needed to execute a successful SEO strategy. In many cases, firms lack the time to spend on the process. A successful SEM strategy encompasses SEO strategies as well as pay-per-click paid placement strategies. The PPC campaign must attract relevant visitors to the marketer’s website and convert a significant portion of those visitors into leads, prospects, and customers. An SEO and SEM professional can plan and execute strategies that result in the optimal combination of paid and organic traffic to your website. Such experts have the required knowledge, skills, and experience to design and execute effective SEM and SEO strategies for your business that deliver results in the form of meaningful returns on investment (ROI). Although you must pay for SEO and SEM services, you will likely gain a substantial return on your investment, especially when you calculate the cost of either attempting SEO and SEM on your own or doing nothing at all.